Hello, everyone! 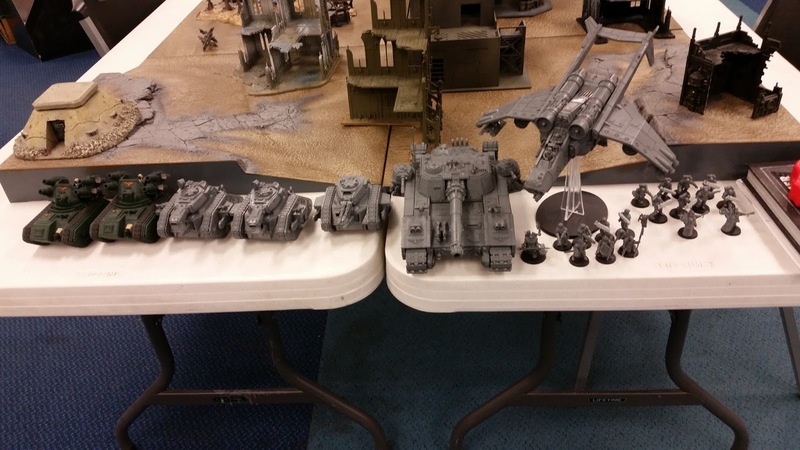 Yesterday I managed to drop by Dreamers Vault and had a couple of games with my Imperial Guard against a Space Wolf list! The first game was Dominate and Destroy, an Eternal War mission. I used my standard Imperial Guard list, which was my usual Spearhead Detachment with a Tank Commander (Leman Russ Executioner with lascannon and plasma cannon sponsons), a second Leman Russ Executioner, a Leman Russ Annihilator and 2 Wyverns, my Kamikaze Vanguard Detachment with 2 Tempestors Prime, 2 plasma Tempestus command squads, 1 Tech-priest Enginseer, 1 Valkyrie, and a Supreme Command Detachment with my Company Commander and his Kurov's Aquila and Grand Strategist Warlord Trait, 2 Primaris Psykers, 1 plasma command squad and 1 Shadowsword. Against them stood the Space Wolves and an allied Imperial Knight (Knight Paladin with twin Icarus autocannons). Uh, if I recall, this Space Wolf list brought a single Vanguard Detachment with Bjorn Fell-hand, a Venerable Dreadnought with a shield and frost-axe, a Murderfang, 10 Blood Claws, 2 squads of Longfangs, each with a Wolfguard Terminator with stormshield - 1 had lascannons, the other had plasma cannons, and Wolf Guard Terminators. Wow, so scary. Anyway, Dominate and Destroy meant we had to capture as many objectives to gain points, while destroying an enemy unit also netted us another point. Yay. We rolled off and my opponent started first. Well, I'm playing Imperial Guard, of course he'll start first. I failed to seize the iniative and so my opponent went first. In the first turn, he moved and advanced his Venerable Dreadnought, Murderfang and Blood Claws, then fired everything he had with his Long Fangs at my...Valkyrie, of all things. Probably wanted to kill my Valkyrie at all cost. Well, all the plasma cannon shots and lascannon shots managed to bring my poor Valkyrie down and net him both First Blood and the destroy objective. None of my dudes died in the crash, surprisingly enough (I had 2 Primaris Psykers, my Company Commander and the plasma command squad in it). The Terminators Deep Struck in my backfield and charged my Shadowsword, eating a few shots in overwatch and losing a few Terminators. The Volcano cannon actually killed 1 or 2, and the twin heavy bolters killed another. The remaining two along with the Sergeant charged in and hammered my poor super-heavy tank, dealing 3 wounds to him. Unfortunately, with WS 5+, I failed to do much with the Adamantium Tracks, and the Terminators made their saves against those that did hit. Oh, and my opponent spent a command point to re-roll the Terminators' charge against my Shadowsword. During this turn, my opponent had 3 victory points, since he was in control of 1 objective. During my turn, I repaired all 3 wounds on my Shadowsword with my Tech-priest Enginseer, moved my Primaris Psykers, Company Commander and plasma squad toward the Terminators, while Deep Striking my Kamikaze Stormtroopers right in the enemy's backfield to capture one objective and shoot the lascannon Long Fangs. Thanks to the Wolf Guard Terminator attached to the Long Fangs squad (I didn't know Long Fangs could take a single Wolf Guard Terminator), he tanked the first 8 shots from my first plasma Kamikaze command squad before dying with a single roll of 2 (he had a 3++ invulnerable save with his storm shield). The second plasma Kamikaze squad wiped out the lascannon squad, netting me one point. Oh, and my Primaris Psykers used smite to kill 1 Terminator with mortal wounds, while the Shadowsword killed another with his twin heavy bolters while left the Sergeant Terminator with just 1 wound. He fired and did 10 wounds to the Imperial Knight, who used the Rotate Ion Shields Stratagem and tanked a few volcano cannon shots. Ouch. The Wyverns fired and decimated the Blood Claws, killing at least 6 of them. The Leman Russ Executioner tanks fired and put a few wounds on the Dreadnoughts, I think the Murderfang had 2 left and the other one had 4, tanking the plasma shots with his invulnerable saves. The Leman Russ Annihilator then fired and took another 4 wounds off the Knight, leaving him with just 10 wounds. Meanwhile my Primaris Psykers, Company Commander and plasma command squad charged the Terminator to help my Shadowsword. Funnily enough, my opponent used the Counter-Offensive Stratagem and had his Terminator Sergeant kill 2 plasma guys after my first Primaris Psyker failed to do anything. In fact, both my Primaris Psykers only landed 1 hit each, fluffing 2 of their strikes despite having WS 3+. And the Terminator made his saves. It was my Company Commander with his chainsword that dealt the killing blow, landing 4 attacks and wounding him 4 times. And the Terminator Sergeant failed just 1 save, and died. The Blood Claws then failed their morale and got wiped out. All of them fled like the cowards they were. Thanks to me capturing 4 objectives and killing at least 3 units, I pulled ahead to 7 victory points to my opponent's 3. The 2nd turn continued with my opponent trying to wound my tanks with the plasma cannons, failing his charge with the Murderfang and not doing much with his Knight after his degrading to the 2nd tier. Bjorn, on the other hand, and the other Wolf Guard Terminator in the remaining Long Fang squad killed both my plasma Tempestus command squads, especially when Bjorn charging in and killing the survivors in combat. That granted my opponent another 2 victory points, and he now had 5. I then put a few more wounds on the Knight, and thanks to his Rotate Ion Shields, he survived with just 2 wounds. 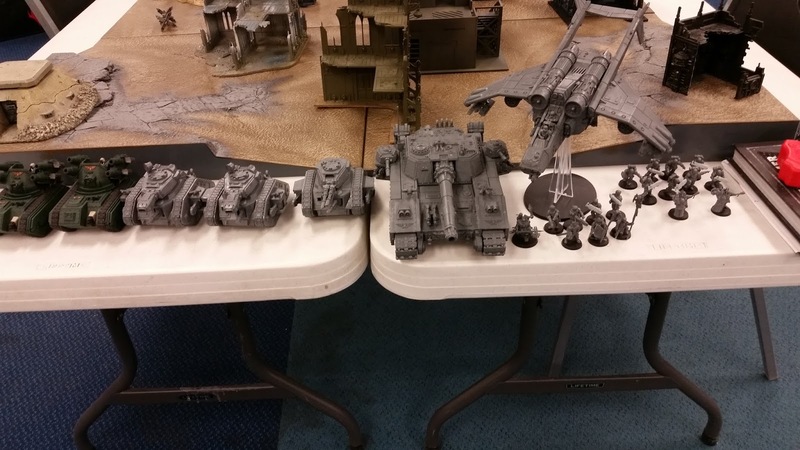 On the other hand, I destroyed both Dreadnoughts - the Murderfang and the Venerable - with my Leman Russ tanks while my Tech-priest Enginseer worked overtime to repair my wounded Tank Commander. One Tempestor Prime stayed on the enemy objective while the other ran away, hopefully to capture another objective. My Wyverns also wiped out the 2nd Long Fang squad, the Terminator guy dying along with the plasma cannon wielders. My opponent now only had 2 models on the table, literally, and I pulled ahead with another 3 victory points thanks to holding all my objectives in my deployment zone and killing about 3 units. So 6, and 13 in total. Bjorn then shot one Tempestor Prime to death while killing the other in melee. The Knight, with only 2 wounds left, lumbered toward my Wyverns but missed all his shots due to firing on BS 5+. My opponent now had 6 points since Bjorn was camping on the Objective he snatched from my dead Tempestor Prime. I then blew up the Knight with my Shadowsword, and gained another 4 victory points, jumping up to 17. Bjorn then slowly moved toward me, being the last and only model left on the table, but my Shadowsword blew him up with his Volcano cannon on that last turn, allowing me to table my opponent, gaining Slay the Warlord and another 3 victory points for dominating the objectives, bringing me up to 22 victory points to my opponent's 6. Ouch. Oh well. We decided to try again. This time, we decided not to use super-heavies. My opponent felt that the Knight wasn't helping much, so he took out the Knight and swapped him for new units. This time, he opted to go for Bjorn, the Murderfang, the Venerable Dreadnought, the same Wolf Guard Terminators and 2 Long Fang squads with their lascannons and plasma cannons, 10 Blood Claws, but this time he included a bunch of Wulfen, Lukas the Trickster, Lorgar with the Wolf Guard Terminators, and that's about it. Since I was asked to take out my Shadowsword, I replaced my super-heavy tank with lots of infantry. I continued to use my Spearhead Detachment with a Tank Commander (Leman Russ Executioner with lascannon and plasma cannon sponsons), a second Leman Russ Executioner, a Leman Russ Annihilator and 2 Wyverns, but I attached a Kamikaze Battalion Detachment to it, using 2 Tempestors Prime, 2 plasma Tempestus command squads, 10 Kasrkins, 2 squads of Kasrkins/ Kamikaze Troopers with 2 hot-shot volley guns, and a Valkyrie. Rounding them out was an infantry Battalion Detachment with 2 Company Commanders, 2 Primaris Psykers (1 of them in the Kamikaze Battalion and 1 of them here since I can only have 3 HQ at most in a Battalion Detachment), 2 plasma command squads, 1 Ministorum Priest (because why the hell not?) and 3 infantry platoons with plasma guns. 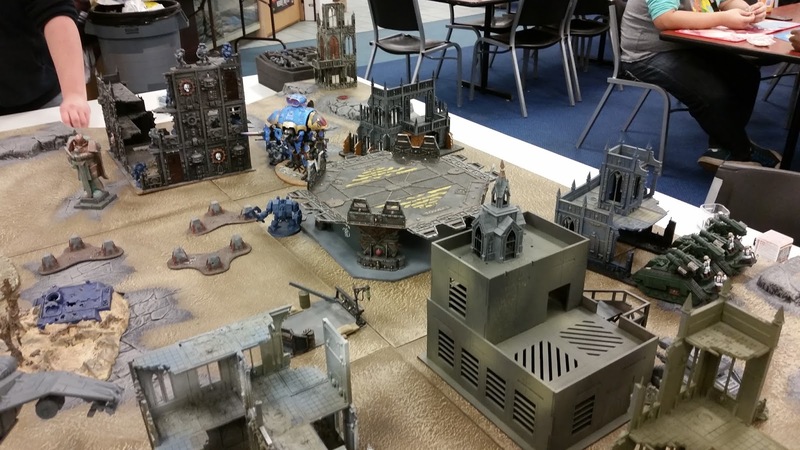 After the first game where my opponent Deep Struck his Wolf Guard Terminators right in my backfield to charge my Shadowsword, I made to spread out my tanks and bubble-wrap them with infantry to ensure there was no space for the Terminators to deep strike into my deployment zone. Yeah! And it worked! Anyway, I actually seized the Initiative this time, but I let my opponent go first. After the crushing defeat and tabling last game, I felt that it was more prudent to give him the advantage. We were here to have fun, not to be competitive, after all. This time it was some frontline thing, the Eternal War mission with 4 objectives - 2 in the no man's land and 1 in each player's deployment zone. Capturing the objective in the opponent's deployment zone netted 4 victory points, the one in my own deployment zone would give me 1, and the ones in the no-man's land gave 2 each. Anyway, I can't remember what happened, but my opponent moved and advanced his 2 Dreadnoughts, Wulfen and Blood Claws. He failed the Wulfen's charge toward my infantry squad (actually, he didn't charge so I didn't bother with overwatch, he only charged after the thing was over and no harm done). 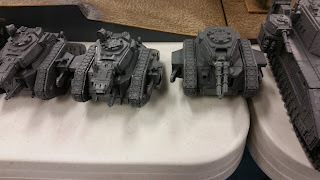 The lascannon Long Fangs were the only ones able to reach my tanks, and they did about 6 damage to my Tank Commander. The plasma cannons Long Fangs wiped out the whole infantry squad in front of my Tank Commander, earning my opponent First Blood, and the Wulfen fired their grenade thing, and their BS 5+ took a -1 penalty because they advanced, and only one Guardsman died. I don't remember them doing any more damage. When he realized that he couldn't Deep Strike his Terminators anywhere in my deployment zone, my opponent decided to hold them back for another turn. During my turn, I disembarked my Primaris Psykers from my now-hovering Valkyrie and had them move forward to Smite the Wulfen. The Valkyrie shot the Murderfang and did some damage to it with his lascannon, I think about 4 or 5. My Stormtroopers Deep Struck all over the place, with me deciding against holding them in reserve like my opponent did with his Terminators. The 1st Tempestor Prime and 2 plasma Tempestus command squads ended up on the right of the Long Fangs while the 10 Kasrkins and 2 hot-shot volley gun squads plus 2nd Tempestor Prime Deep Struck right behind Lukas the Trickster (and Blood Claws). My Valkyrie and Wyverns wiped out all the Wulfens with their heavy bolters, multiple rocket pods and Stormshard mortars - those guys are so tough! Actually, one guy survived, and the infantry squad right in front of them fired...or to be exact, the plasma gunner in that infantry squad fired his overcharged plasma gun and killed the Wulfen before the others could fire their lasguns. My Kasrkins received First Rank, Fire! Second Rank, Fire! and fired 18 hot-shot lasgun shots into Lukas...and succeeded in killing him. I failed to kill the Murderfang or the Venerable Dreadnought, leaving one of them (the Murderfang, I believe) with 2 wounds and the other with 4. The Venerable Dreadnought was tanking all the plasma shots from my Leman Russ Executioner with his 3++ invulnerable save. Ugh. On the other hand, my Kamikaze Troopers with plasma lit up the Long Fangs again. The first squad killed the Wolf Guard Terminator who tanked all the plasma shots, and the second squad wiped out the lascannon dudes, leaving just the Sergeant with the plasma gun. Business as usual. I had used Jury Rigged on my Tank Commander, and he used his lascannon to fire on the plasma Long Fangs, killing one of them. My Leman Russ Annihilator also fired on them and killed another 2, leaving only 2 guys left. The guys with the hot-shot volley gun fired on the Blood Claws and killed a couple, but there were still quite a few of them left. During my opponent's next turn, he finally Deep Struck his Terminators and Lorgar right in front of my Tank Commander. He also moved his Blood Claws and 2-wound Venerable Dreadnought back while his Murderfang moved toward my 2 Primaris Psykers. Bjorn also moved toward my Tempestus command squads. He then charged and had to spend a Command Point to reroll his charge for the Terminators into my Tank Commander, and despite me using Defensive Gunners, I only did about 2 or 4 damage to Lorgar before my Leman Russ tank was torn apart by raging Terminators. Uh oh. The Murderfang also came in, fired and wounded my first Primaris Psyker with his storm bolter and heavy flamer before he charged and tore my first Primaris Psyker apart in combat before consolidating into the second, while the Blood Claws fired their boltguns and killed at least 5 Kasrkins before killing another 4 in combat. The Sergeant lived to fight back, but there was no way he could survive morale, so he fled after ineffectively slashing at the Blood Claws. At the other side of my opponent's deployment zone, his Sergeant fired his plasma gun, as did the 2nd Long Fangs with their plasma cannons, and they killed one Tempestus Command squad while killing 2 in the 2nd squad. Bjorn advanced on them, but for some reason didn't kill him? It didn't matter. The game was mine. My Primaris Psyker used Smite to kill the Murderfang while my Valkyrie killed the Venerable Dreadnought with his lascannon. He used his heavy bolters and multiple rocket pods, as did my remaining Leman Russ Executioner, to fire into the Terminators and I killed a few of them, thankfully. My other infantry squad moved forward to back up my other infantry squad who was bubble-wrapping my Leman Russ tank before, and both squads fired several more times to wipe out the Terminators. Thanks to my nearby Company Commander, 1 of them had First Rank, Fire! Second Rank, Fire! But Lorgar was still alive. Meanwhile, my Wyverns killed both Long Fang squads, or to be precise, killed the sergeant with the plasma gun, and then the 2 guys with the plasma cannons. My Leman Russ Annihilator then fired his lascannons and destroyed Bjorn the Fell-Handed (who died for the second time that day). At this point, my opponent only had Lorgar left. That was because my Kamikaze Troopers had fired their hot-shot volley guns and completely annihilated the wounded Blood Claws. Oh...yeah. At that point of time, my opponent only had Lorgar left. Just one model. Deja vu? Lorgar did his one last stand by charging into my infantry squad and killing half of them in combat. Ouch. At that point, that was all he could do, really. My unwounded infantry squad continued moving toward him and my Company Commander toward them for order range while the half-man squad, who somehow survived morale, fell back and ran away. Meanwhile my Valkyrie boosted and disembarked my Warlord Company Commander and his 2 plasma command squads onto the objective in the no-man's land. My remaining Tempestus command squad with 2 fellas left moved and advanced toward the 2nd objective in the no-man's land. My 2 Kamikaze Trooper squads with hot-shot volley guns also moved and advanced toward the objective in my opponent's deployment zone. During shooting phase, I ordered both the command squad and the 2 Kamikaze Trooper squads to Move, Move, Move! - basically the move and advance order - and they moved into their objectives, as did my 2 plasma command squads. In other words, I had all 4 objectives under my control. My Leman Russ Annihilator did the coup de grace and fired his lascannons at Lorgar, and annihilated him. Muahahaha. End of the game - I had Linebreaker, Slay the Warlord and 4 objectives - 1+1+1+2+2+4 = 11 Victory Points in total. Compare that to my opponent's 1. Does anyone have any advice for my Space Wolves friend? What he should have done better, or what units he should have used? Thunderwolf Calvary instead? Less Dreadnoughts? Ditch the Blood Claws? Thanks.